Transcript: ESPN’s Burke Magnus and American Athletic Conference’s Mike Aresco - ESPN Press Room U.S.
ESPN and the American Athletic Conference have reached a 12-year extension for the conference’s global media rights, strengthening the conference’s extensive existing presence on ESPN’s television networks and adding thousands of events on ESPN+, the industry-leading direct-to-consumer sports streaming service, through 2031-32. The extension begins with the 2020-21 academic year following the final year of the agreement between ESPN and the conference that began in 2013-14. Burke Magnus, ESPN Executive Vice President of Programming and Scheduling, and Mike Aresco, American Athletic Conference Commissioner, held a media conference call to discuss the deal. I first want to thank Jimmy Pitaro, president of ESPN, and Burke Magnus, ESPN’s executive vice president of programming and scheduling, as you’ve just heard Bernie describe him, and his team of Nick Dawson and Pete Derzis for their support of our conference. This is one of the best negotiations I have been involved in, and I have been involved in quite a few during my career. I also want to recognize and thank our conference leadership, the chair of our board, President Renu Khator of the University of Houston; our Vice-Chair David Rudd, President of the University of Memphis; and Gerald Turner, President of SMU, who chaired or ad hoc media committee. All have offered valuable counsel and support, as have our athletic director chair, Tom Bowen of Memphis, and vice-chair Troy Dannen of Tulane University. Our presidents and athletic directors have enthusiastically supported this agreement and the vision it represents for the conference. I want to recognize and thank my staff for their hard and diligent work on this landmark agreement. In particular, our chief operating officer, Donna DeMarco, and our chief financial officer, Eric Ziady, with special kudos to senior associate commissioner Tom Odjakjian. The people at ESPN know Tom well, who worked closely with me on the strategy and details of this complex negotiation. No one knows the TV media landscape, programming and scheduling better than Tom. Also providing valued insight and assistance were our media consultants Ed Desser and John Kosner. Finally, I want to thank our outside counsel Peter Zern for doing his usual quality work on our behalf. This is an historic day for the conference. We could not be happier to be extending our relationship with ESPN, a great media partner whose platforms over the past six years have provided us with the ability to build a nationally-respected brand. We will have increased exposure on ESPN’s priority platforms, which include ABC, ESPN, ESPN2 and ESPNU, and we will be featured on ESPN+, ESPN’s fast-growing and innovative digital platform. We are excited to have ESPN+ as a key component of this agreement, one that complements our presence on the priority ESPN platforms. ESPN+ is the cutting-edge future. It is exceptionally reasonably priced. It is easy to access and use. It is fast growing and is available everywhere. Our Olympic sports and women’s basketball will especially benefit from the ESPN+ exposure. With the unmatched promotional clout of Disney and with its aggressive content acquisitions, ESPN+ will be a major presence in the digital age, and being a branded part of ESPN+ will be like having our own conference network, and more of our sports will now be available to more of our fans than ever before. I applaud ESPN for what they’re doing in this area. This agreement positions us well in the changing media landscape and moves us closer to our Power Six goal, and channeling the late great John Houseman, I would add that we are moving toward a Power Six designation the old-fashioned way. We are earning it. Despite the obstacles we have faced, our institutional leadership has never wavered in its commitment to regain our former position as a Power Six conference. Although we do not release financial information, this agreement provides financial security and additional resources for our member schools who have competed incredibly effectively even with limited resources. You have seen our competitiveness throughout the six-year existence of our conference and especially in our recent football seasons and in this year’s NCAA men’s and women’s basketball tournaments. The credit for the developments that led to this agreement goes to our administrators, staffs and coaches, but most of all, to our student-athletes, whose competitive spirit and drive made possible what many thought impossible. We are delighted to be moving into a very bright future with ESPN. Thank you. Thank you very much, Mike, for your kind words. My first thank you is to Mike specifically. You know, you have been a tireless and passionate advocate on behalf of The American and all of your member institutions, and quite frankly, without your drive and your dedication and the results that your institutions have seen on courts and fields, subscribing to your vision for a Power Six world, none of this would have been possible. Mike deserves an unbelievable amount of credit here, and frankly, it was one of those great circumstances where his vision and our vision came together in a very seamless and ultimately, I think, a very beneficial way for both sides. I’d like to thank Mike’s key presidents, he mentioned them, President Khator and President Turner, (athletic directors) Tom Bowen, Troy Dannen. Obviously the trust that these people and all of The American member institution leadership, both at the university level and the athletic department level, have placed in our company is very encouraging to us. Like I said, it’s definitely a case of our respective visions coming together at the perfect time. We are incredibly excited at several components of this agreement, most notably, it’s a long-term agreement that secures this content on the Disney platforms for 12 years. It extends a preexisting relationship that dates back to 2013 with the very formation of The American Athletic Conference. It is comprehensive in nature and takes advantage of Disney’s unmatched array of distribution outlets and platforms across the board. It has an emphasis on football and basketball, obviously, but now for the first time brings together an unbelievable array of what we refer to as Olympic sports. You know, the depth and breadth of the content distribution here will benefit all the institutions, all of their sports, all of their student-athletes. I think this crowd knows how seriously we take women’s sports in particular, and this will be groundbreaking in terms of the exposure provided to women student-athletes at The American institutions. And lastly, for us, it has a component related to ESPN+ that is going to be an unbelievably great addition to the already powerful array of content that we’ve acquired for ESPN+ as we add a formidable direct-to-consumer sports product to the array of our distribution capabilities. Like so many businesses before, college sports is a huge component of ESPN+’s offering, and to have a comprehensive deal with a conference like The American for ESPN+ will be incredible to contribute to its already rapid growth. I’m sure there’s a lot of questions, but I did want to thank everyone on Mike’s side of the table for their dedication to getting this agreement in place, and then I’d also like to thank my team in particular, Pete Derzis and Nick Dawson for really bringing this agreement to fruition. Q: You both trumpeted the ESPN+ side of this thing as a great bonanza for both sides, though I am wondering if The American would have been able to earn as much if it did not agree to have more content put on the ESPN+ platform? MIKE ARESCO: Well, again, I really can’t comment on that and I wouldn’t comment on any ESPN internal deliberations. All I know is that ESPN+ is very important to ESPN and very important to us, and I applaud Burke for the manner in which ESPN has not only rolled it out but explained it and talked about it. As far as we’re concerned, ESPN+ is the future, the direct-to-consumer, as Burke said. It’s an innovative digital platform that you want to be on. In fact, we still have more coverage on the priority networks of ESPN than we had before, which is terrific for this conference. But the fact is there are going to be more sports offered on ESPN+ than ever before. Again, it’s as though we have our own branded network on that platform. So it was obviously an important part of the deal, but I am not going to speak to what portion of it it was. BURKE MAGNUS: If I could just add, if you go back and look at the constituent parts of the 2013 deal, this deal is a much different deal. It’s much more comprehensive. There’s a lot more events that are included. ESPN+ was a key component to driving value without question, but frankly the thing we’re most excited about is that that new platform allows us to consider doing a deal that quite literally acquires every athletic event that the conference stages. Without it, it wouldn’t — we couldn’t do a comprehensive deal like this. So it’s important in a couple of ways, but it certainly helped drive the overall value conversation. Q: And if I could just come in with something that’s a little more granular and has to do with UConn women’s basketball which has had its own sort of separate platform, local distribution in the past, that has been obviously a big deal for folks in Connecticut, I’m wondering if there are any plans to farm out some of those games so they are available through more traditional platforms in the state of Connecticut, SNY, in the past, PBS, things along those lines? BURKE MAGNUS: Obviously I think as this group — as the group on the phone understands, we still have an entire year, the 2019-20 season under the terms of the prior agreement, which gives us plenty of time to have conversations and have meetings with all interested parties about this content, and that’s what we intend to do. So in the case of SNY specifically or CBS Sports Network, which sublicensed some content to us under the terms of the prior agreement, I’m certain we’ll sit down with both of those guys and see where they are in terms of their interest in continuing those kinds of relationships. And we have the time to do it. That would be our intention. Q: Mike, the press release noted that there were going to be 40 football games on various ESPN television platforms, which is an increase. I was curious if you happened to know what the current numbers are. MIKE ARESCO: Yes, the current is 26. Q: And secondly, 12 years is a very long time. The other conferences have recently gone to some shorter ones which various changing media platforms. Why did you feel that 12 years was the right length and to go so long? MIKE ARESCO: First of all, we appreciated the confidence ESPN showed in us. Burke, was obviously the point person in this deal, and we appreciate the confidence they showed in us. But a long-term deal affords both sides a great deal of security. By the way, most of the deals among other peer conferences were long-term. There might be a few that were shorter, but most were long-term. In our view, as you go out further, if we’re successful, we obviously can sit down with ESPN and even talk about extending and redoing some things down the road. The point is it gives you a lot of flexibility, but it also gives you security. We are very happy we have a deal that we felt was very fair, and it gives, our schools a chance now to build their brands and to grow. You’re not sitting there worried about negotiating another deal in a short period of time. And you know, when you get the kind of exposure we’re getting and the kind of overall opportunity to build this conference, and we’ve elevated it and we’re going to elevate it further, doing a longer term deal made a lot of sense. I can’t speak for ESPN. I would leave that to Burke. But I believe they feel comfortable, too, doing a long-term deal with us. It just makes a lot of sense. BURKE MAGNUS: Yes, longer terms have been typical of major college conferences, I think. Everything we’ve done has been eight, 10, 12, 15 (years), sometimes longer, including the SEC, ACC, Big 12, Pac-12. MIKE ARESCO: I was involved in a 15-year deal at CBS, so again, these deals typically have been longer term. Q: And for Burke, a lot of these deals have been going to ESPN+. Is this part of any sort of plan to phase out what is currently WatchESPN that comes with cable packages? BURKE MAGNUS: WatchESPN is in the process of being incorporated into the ESPN app, which is our authenticated streaming level layer. So the app going forward will be three things. It is right now an array of free content, short-form highlights, information, statistics and so forth. It’s the authenticated content from our linear networks tied to your cable or satellite telco subscription, and it’s ESPN+, which offers more content for direct-to-consumer for an additional subscription. Q: Burke, I wanted to ask, how much impact, if any, did the play on the field with teams like UCF and what they’ve been able to do brand-wise impact the terms of this deal with The American? BURKE MAGNUS: I think in a really significant way. Like I said at the top, Mike has been a great cheerleader and advocate for his institutions, but that only takes you so far. The schools have to back it up on the field, and I think they have. UCF obviously in football – and men’s basketball for that matter – Houston in basketball this year, the quality from top to bottom has been very strong, and it’s been sustained over multiple seasons. That’s really what we looked for in the last deal was could these schools live into the premise that Mike and team were espousing in terms of their proximity to the Power Five, if you will, and I think unquestionably they’ve done that. Q: Burke, what have been the demographics regarding ESPN+ signups? Are they done by primarily younger users? Do you have widespread people that are adapting to this new technology? And at what point — what percentage of ESPN+ content do you think college sports will be taking up over the next couple of years? BURKE MAGNUS: I don’t believe we’ve released any demographic information, but obviously I think it stands to reason that the subscribers in this environment tend to be younger rather than older, and what we have released so far is our overall number, which Bob Iger did at the most recent Disney earnings call that we have passed — within 10 months we have passed over 2 million paid subscribers on ESPN+, and that will continue to grow, obviously, and we’re encouraged by those early results. College sports, like I said, will I think be a big part of it. I think it provides the opportunity for conferences of all shapes and sizes to have really deep-branded comprehensive environments in that product where their fans can have accessible and affordable access to high-quality content in a comprehensive way, and well beyond just football and basketball, which tend to be — or have tended to be the bell cows, if you will, for linear television. Q: Mike, you’ve negotiated these deals from the other side of the table. What are the new elements now that have to be taken into account when you’re negotiating these deals that weren’t in place when you were doing them for CBS? MIKE ARESCO: Well, the deals are more complex now, and in terms of allocating your programming and in terms of determining how you’re going to get your product exposed, it’s more complex. But here’s one of the factors, and this is a credit to Burke and ESPN. We know them, they know us. We were very comfortable dealing with ESPN. We know how they schedule. They know how we schedule. We have a long relationship. We understand the nuances of this, and it’s one-stop shopping, as well, with a company that can offer you so many different things and so much promotional support. I think the biggest issue here was determining what we would do on the primary networks, how we would structure the deal vis-a-vis ESPN+. Obviously the length was an issue, as well. And how we would schedule, would we continue to do our very successful Thursday, Friday series. There were some other things that we were thinking about doing that we can’t discuss now around scheduling. All of that is very complex, and again, that’s why having someone like Tom Odjakjian with me is extremely valuable. He has worked with the ESPN people, whether it’s Nick Dawson, whether it’s Pete Derzis, Burke’s team, we’ve done a lot of this and we’ve seen where we can generate interest in ratings. I think from my days, the deals have just become more complex, but there’s one other thing I would say. The world has changed, and it really gave this conference an opportunity. What I’m most pleased about is I think ESPN, with Burke leading the way, recognized that and recognized the potential that’s still there in this conference. We have accomplished a great deal. We have had more games than I can count that have had 2 million viewers, a million viewers. But we have just scratched the surface. This conference has tremendous range. We have 2.7 million alumni, 350,000 plus students, some of the bigger universities in the country, millions of fans, and the question was going to be, okay, how do we satisfy the demand for our product, how do we increase the demand for our product? I think this deal is comprehensive, and I think it’s going to do that. For instance, ESPN+ will give our Olympic sports, baseball, soccer, rowing, golf, track and field, cross country, swimming and diving, tennis, it’ll give those sports feature status that they never had. In addition, we have the ability now to televise all of our women’s basketball. A lot of those games were on platforms that were very localized. So again, this has given us an opportunity in a very complex deal to really get our brand out there and allow people to enjoy the competitiveness of our sports. Q: Did you get to the point where you entertained other offers, or did ESPN and you come to the agreement during ESPN’s exclusive window? MIKE ARESCO: We have really enjoyed our ESPN relationship, period. It has been a terrific relationship. We wanted to extend it, and we’re very happy that we worked together with Burke from the very beginning, and as I said earlier, his confidence in us was critical. Burke is the key acquisitions person at ESPN, and Jimmy Pitaro was incredibly supportive from the very beginning, as well. We saw no reason not to want to extend with ESPN if we could get the kind of deal that made sense for both of us – we were able to, and it’s as simple as that. It was something that we really wanted to do and we had every reason to do. Q: Is there any kind of opt-out before the 12-year window? And the second question is in Memphis, the average fan would like to know — is there any way to say what percentage of say Memphis football and basketball games will be on the priority network? Can you give any concept of that or will that be determined based on how the year is going for that particular team? Just some sense of that, please. 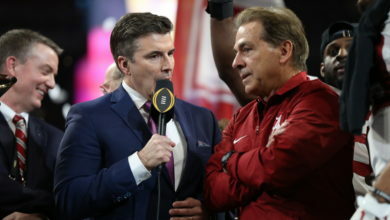 BURKE MAGNUS: I would say on the scheduling piece, I think it’ll work in football and basketball generally the way it’s always worked, which is we tend to focus on teams that are relevant to the National Championship CFP picture and bowl picture on the primary networks. And there will be appearances, guidelines and that kind of thing that will be at play, but typically it will work the way it always works, which is we’ll tend to focus on the most relevant competitions on the primary networks between the teams that are performing at the highest level. BURKE MAGNUS: No, there’s no way to — it won’t work that way, unfortunately. There’s no predictive mechanism you can apply to how many or anything like that. Q: And is there any kind of opt-out before the 12 years? BURKE MAGNUS: No, but we don’t have the kind of relationship with The American that requires any kind of opt-out. We have constant and ongoing conversations on a daily basis. That’s my job and my team’s job is to make sure that the relationship is such that we’re always talking, and whether that’s about complicated issues or whether that’s about exciting opportunities, we’ll always be in concert with each other relative to adjustments along the way. Q: This is specific to Navy: Notre Dame-Navy, a very valuable entity, always has been. The Navy home game in that series is now part of this contract. Can both of you speak to the value of that? MIKE ARESCO: I would certainly want Burke to comment, but my feeling is it is extremely valuable. It’s Notre Dame against Navy, which is a long, storied rivalry. It’s one of the longest in the country. They have been very competitive games, and especially over the last decade and a half. They are played at interesting sites with full stadiums. So for us, it was important to have that be part of this deal for ESPN, for our partner. We’re excited, and the first game is going to be in Ireland in 2020, which should be a tremendous experience for everyone. BURKE MAGNUS: Everything is consistent with what Mike just said. I mean, we were excited that the Navy-controlled portion of that series was in this agreement now, and obviously it’s a high-caliber competition and storied rivalry, like Mike said, that we found to be incredibly valuable to be in this package. We’re excited to have it. I think the farthest out my travel schedule has been determined is that I’m quite certain I’ll be at that game in Ireland. Q: Navy has this separate deal with CBS Sports Network for all its home games. You’re getting your pick of one of those. Did you want more? Why let Navy have whatever the remaining five or six home games it has? Did you push for more than just one home game, and if not, why do you feel just one choice of one of the Navy home games to move over to ESPN from CBS Network is sufficient? MIKE ARESCO: We discussed this with ESPN, and Navy has unique scheduling requirements as a military academy. You’re well aware of their homecomings and they have to schedule games well in advance and can only do home games at certain times of the day, ESPN, as you know, is the major distributor of college football. So we looked at that, and it was a joint decision that there were certain things that ESPN probably wouldn’t have been able to do or certainly those games would potentially have been in the package. The relationship that Navy has with CBS Sports Network allows them a lot of flexibility, and so therefore that was why that deal was done. ESPN is happy to have that home game because they are able to schedule that one premier home game each year, and that’s going to be great. In addition, they get the Navy away games in our conference. There’s much more scheduling flexibility with those games. BURKE MAGNUS: Between those two components, the road games, the one home game and the Notre Dame game every other year, we thought that that would suffice in terms of access to Navy football. Like Mike said, with the unique requirements that they have as a service academy in terms of what they have to do with their home games, this was probably the best solution for both sides. Q: ESPN+ now I think is $5 a month now for subscribers. Is there anything built into this contract or any assurances of the cost to subscribers, five years, 10 years down the road as protection against what’s becoming unaffordable for some people? MIKE ARESCO: We wouldn’t get into any pricing. BURKE MAGNUS: The pricing of the product is — will be managed by us. Right now it is $4.99 or $49.99 for an annual subscription, a 20-percent discount off the monthly price, and our primary concern is continuing to add compelling content to the offering, which we’ve done fairly aggressively over the last year. The first anniversary of launch is April 12th, so we haven’t been at it yet quite a year, but we’re content-focused at this point and not on the price per se. Q: Just curious if you have any comment on some of the financial figures of this deal that were reported elsewhere and any other financial information about the deals, whether it’s overall or with specific schools that you’d wish to comment on? MIKE ARESCO: I can’t comment. We don’t comment on any of the financials. Q: Mike, in what ways does this agreement impact the production of live events from a school perspective? Many of ESPN’s new partnerships like the SEC, the ACC, even conferences like the Ivy League, they place a lot of the production efforts, especially for Olympic sports, on the schools themselves. Has there been any kind of a conference-wide decree sent out to the schools in terms of building up production facilities, expanding departments? How do you foresee that potentially playing out? MIKE ARESCO: Well, knowing that we would likely have a large presence on ESPN+ and we would have certain production requirements, we’ve been in close touch not only with ESPN but with independent consultants, and we’re working on the necessary infrastructure. All our schools have bought in to that, and they know they’re going to have to build up infrastructure, and it’s something that is ongoing. In addition there are different ways we can handle the production, either through the conference or the school, but we will be required to produce events for ESPN+. But we are very confident that we will be in good shape there. We obviously have some lead time in this deal, and for quite a while now, and by the way, even before we started negotiating with ESPN, we had a sense based on the changing world and where things were with ESPN and what we saw other conferences doing, that we would likely be involved in this. So we engaged consultants and we talked to ESPN about the right ones to talk to, so we’re well ahead of schedule on this and we’re very confident that we will not only be in a position to produce events at a high quality and a good standard but that we’ll have the infrastructure in place well before we actually need to use it. Q: Burke, when you’re striking collegiate conference deals like this, how much of the conversation is centered around these kinds of efforts that you’ve taken, empowering the schools with technology, graphics packages, advice to kind of produce — especially the long-tail of these live events? BURKE MAGNUS: It’s been a pretty successful partnership so far, in particular with the SEC. The institutions have appreciated, I think, the expertise that we bring to the table in terms of getting their institutions in a position to produce and distribute this content and to get their institutions up to certain capabilities, and then to provide a real-world practical experience for a lot of their students and have some of their staff learn from people who are doing this full-time for a living. So it’s been a great partnership to date. I think that will be the case here, as well, and the added benefit for both sides at the end of the day is you get thousands and thousands of events produced, and only a few years ago, those numbers were considerably smaller, so it’s been great exposure opportunities for Olympic sports, for women’s sports, for really everything that happens on campus, even things beyond sports have — commencement ceremonies and other things have been — the same infrastructure has been applied to produce and distribute that content on an institutional level. It’s really raised the bar in circumstances where we’ve done this previously, and I think this will be no different. Q: Just for clarification, anything that’s designated in the schedule an ESPN+ game will be produced by the school or it might not be as clean as all that? MIKE ARESCO: No, we will produce the events, and anything we do produce would be on ESPN+. We have certain minimums that we have to produce, but if we do things beyond that, and we may, then those events would be on ESPN+. Q: A lot of UConn fans, they WatchESPN but they’re not that familiar with streaming services. I know I can get this channel on my laptop, but how much of a hassle is it to get it hooked up to my TV, and will ESPN be available in bars? BURKE MAGNUS: Are you talking about ESPN+ in this case? Q: Yes, ESPN+. If a UConn game is on ESPN+ and a bunch of us want to go to a watering hole to watch the game, will we be able to do that? BURKE MAGNUS: On the first part of your question, ESPN+ is available in the same way that Netflix is, for example, now. It’s across every platform, every technology, every over-the-top device, whether those are AppleTVs or Rokus or Chromecast, et cetera, on your iPhone, on your computer, on your Android device. I mean, everywhere that you can get the ESPN app, frankly, ESPN+ is available on all of those devices and technologies. So it’s pretty widely available. I mean, Netflix has 140 million subscribers worldwide, so there really isn’t that high a bar in terms of people’s understanding of how to access over-the-top streaming technologies at this point. Commercial establishments is a work in progress. Obviously there’s a bunch of commercial establishments who get their video services through some of the platforms that I just mentioned, and if that’s the case, then ESPN+ would be there, too. But it’s not as ubiquitous today as it is in the home. So like I said, that will be a work in progress. Q: This is for either of you guys. You mentioned the increase from 26 to 40 in football games on the three main networks. Will there be an increase in men’s basketball, as well? MIKE ARESCO: There is an increase in terms of the priority networks, yes. There is. It basically doubles in terms of the minimums. Q: Do you have any idea what the minimums were? MIKE ARESCO: They were around 32, and now we’ll go to 65. So there’s a significant increase there. And again, those are — as Burke pointed out earlier, those are the premier games. This is why this deal is very good for the conference, and we hope very good for ESPN. Our premier product will have even more exposure on the priority networks, and we will also have the ability to have all these other events that were not really showcased at all before. Q: Will schools incur the production costs for the ESPN+ events? MIKE ARESCO: We are still working on how we’re going to deal with that. We will figure it out internally, and that won’t be something that we’ll discuss publicly. All I can say is we will produce these games at a good level. The production values will be very good. Q: This is for either one of you. Practically all UConn basketball and football games have been on either cable or broadcast television outlets forever. Do I understand this package to mean that a substantial number of those games will now be only accessible on computers and devices for a fee, and if so, approximately what percentage of UConn basketball and football games do you think will be available only on those paid streaming services? BURKE MAGNUS: I think, as I answered with the gentleman from Memphis, I think it’s really difficult to suggest on an annual basis which games will be where or what percentage of games will be where. But there will be some games on ESPN+, which is a streaming service, which is available to everybody. I hesitate to try and draw lines or attach numbers to that, but there will be some, yes. MIKE ARESCO: I would just say, though, there are still a significant number of games that are likely to be on priority networks. An example, UConn women’s basketball, they will be getting as much coverage as probably many men’s programs around the country on priority networks. So consequently, you really have to strike a balance, and it’s a good balance, because again, we want to be part of a cutting-edge digital platform. That’s very important. We have to look to the future, and that’s extremely important. In addition, on the priority networks, we still have significant coverage, and in many cases better coverage than a lot of schools have. So again, I think that this coverage will build, continue to build its reputation, its brand with the kind of coverage we’re getting, and we’re very happy with it. Q: This might be a little bit of a matter of clarification, but Tulane University has a streaming option on their website for pretty much all home sporting events behind a pay wall, currently baseball, all home baseball games are available through this. Under this new deal, will all baseball games appear on ESPN+? Is that part of the inventory, just about everything that would be under say typically a school-controlled sort of pay-per-view type service, will that be shifting over to this platform? MIKE ARESCO: Yes, anything the school produces will be on ESPN+. Q: I apologize for having two quick questions. Mike, you can probably clarify this first one. Is this an exclusive deal with Disney, or is The American not yet done yet in relation to its media properties? And also, regarding the Olympic sports, I know some part of this was mentioned before, but I just wanted to clarify, have you with The American — have you established any financial or content and production standards for the schools to follow with regard to Olympic sports production since it’s going to be in the hands of the schools for the most part? So for example, is there any sort of standards in terms of the number of cameras that are involved and things like that? MIKE ARESCO: This is an exclusive deal with ESPN with one relatively small exception. We have a deal for a handful of select basketball games with CBS Sports, the broadcast network, and we will be engaging in talks with them, and that’s been a deal that we have had in place for many, many years, going back even before the reestablishment of this conference. But other than that, aside from those Navy games, this is an exclusive deal with ESPN, and we’re very happy about that. One of the great things about dealing with a company like ESPN is the one-stop shopping, I, as commissioner, don’t lose an ounce of sleep ever knowing that our games and events are going to be on ESPN platforms because when the assignments go out each week, I know that I am pleased that our membership enjoys the coverage and the exposure they get on ESPN. ESPN is the leader, and it will remain the leader, and we couldn’t be happier about that, so consequently we were very happy to do an exclusive deal. As far as the production standards, we’re working with our schools. We will certainly work with them to establish a minimum level of quality. You want to make sure that these are quality productions. We are not necessarily going to dictate the number of cameras or that sort of thing, but we will make sure that there is a certain level of production – and our schools understand this. They understand that they will be required to, and they want to. They want to have their product displayed in a good way. So this is not going to be any kind of issue within the conference.